In our new editorial feature series, Voices of Gin, we interview influential individuals in the global gin community. We meet the people whose activities and businesses play a role in telling the wider story of gin and help support gin makers. We wanted to highlight some of the people we see as being key figures who drive forward the discussions surrounding the gin category and whom we see as adding value to gin. You might recognise Olivier Ward from his Sunday segment on Channels 4’s Sunday Brunch, where he puts the guests and a range of specially curated gin based cocktails through their paces. Olivier, along with his brother Emile, started Gin Foundry as a gin blog back in 2010. Over the last 9 years the brothers, along with freelance staff writer Leah Gasson, have turned Gin Foundry into one of the most respected online resources for factual, unbiased and in-depth content about the world of gin. Not only this, through a lot of sleepless nights, good old fashioned hard work and elbow grease, they created Junipalooza, one of the premium gin events on the gin calendar. Speaking of calendars, they also produce Ginvent, a carefully curated advent calendar featuring a number of gins to be enjoyed and savoured in the run up to Christmas. The brothers also established Gin Kiosk, an online gin shop. 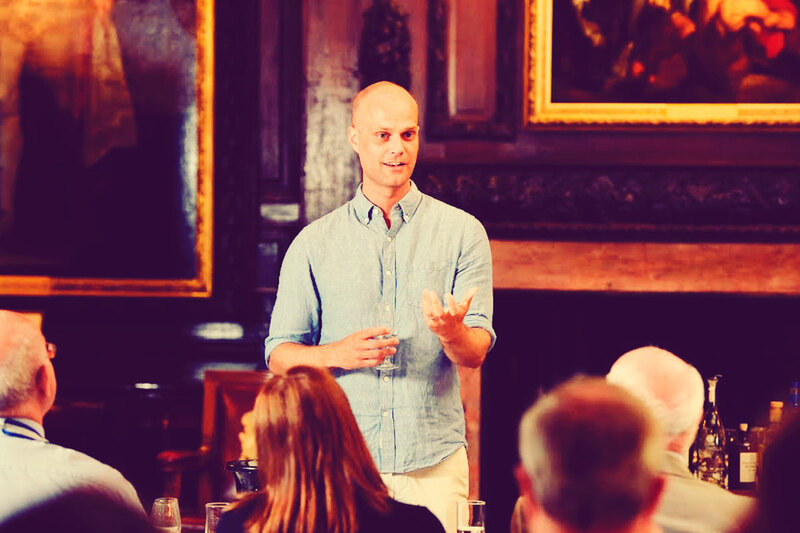 As if all that wasn’t enough, Gin Foundry also run a number of workshops and classes designed to help support new gin brands discover botanicals, develop flavour profiles and set up a distillery. We caught up with Olivier to get this thoughts on a variety of gin topics. What motivated you to establish the Gin Foundry? We’re both huge believers in that every pound you spend is an endorsement of what you believe in. Whether consciously or not, when you buy a gin, you buy into the taste, the way it’s made, the people it’s made by and everything that occurs along that chain. We wanted to showcase that wider world, the entire process, the people whose lives are dedicated to delivering great liquid that’s imbued with their creativity and endeavour, and talk about all these other facets of the gin industry in order to help those curious truly understand what was on the shelf. What were the objectives of the business and have they changed? To celebrate gin as a category and facilitate drinkers finding the perfect gin for them. We tend to look at how to do that in two ways, where sometimes the spirit needs patrons or champions to lift it, others need a platform on which it can thrive. We try and do both and while the core objectives haven’t changed, the way we go about doing so has to ensure we keep up with the times and the evolution in the category. Who’s supported you and the Gin Foundry? There are hundreds of people. The amount of time it takes for producers, trade, educators and manufacturers to explain what they do and help further our understanding has been huge. Readers, festival goers, shoppers – they’ve all made it possible to operate as a small business. We’re self-funded and self-taught, so everything has been a learning curve and everything has needed help in some shape or form. What’s been the highlight of your gin journey so far? We get an amazing satisfaction out of seeing others go through their journeys, so in a strange way the highlight reel for me is actually other people’s achievements. I’ve always said it, but gin is about the spirit of the maker and the spirit they make. Most of the craft distillers have been people we’ve tracked and spoken to over years and years, many of them came to workshops, events and courses we’ve held at some point. We see them at a really early stage, get to watch them evolve, we get to write about them, try and promote them, try and share their stories with others. To watch them hit their goals and celebrate it alongside them are always our favourite moments. What obstacles have you had to overcome to get to where you are now? They come daily in all their forms. Emile deals with most of the actual obstacles to making the business work, while I tend to live in a word in personal insecurities and trying to channel it towards something constructive. The one that comes up more often than any other (and takes many forms) – is getting people to stop only ever trying to do something that will solely deliver something for themselves and to see the bigger picture, collaborate and stop being so phenomenally self-centered. The ‘what is this doing for me’, or ‘what can I get out of this’ is all-pervasive with some distilleries, which makes it hard to do any work together as everything needs a bit of give and take. What’s the best and worst thing about working with your brother? People always forget that Gin Foundry is two people and so all that we do is carried on our shoulders. I’ve never met anyone who could keep up with the workload and pace that Emile sustains so in terms of day to day, there’s no down side. I think the best thing about working with family is that personal fulfilment and personal happiness is as important to both of us, and for each other, so many decisions that we now make as a company are geared towards delivering that as opposed to being entirely commercially minded. How important is provenance to you as a gin drinker? I don’t care where it’s made geographically, so long as what it says is true and it isn’t trying to hoodwink consumers. The thing about provenance that matters to me is that if someone is using a location to sell what’s in the bottle or what they are about, it better be palpable in the liquid. It needs to be evocative and transportive and take me to that location. There are so many that say they are from somewhere, and whom use local botanicals I just wonder, why bother? It made life harder, you can’t taste a finite difference, and the gin doesn’t bring a sense of escapism either. It’s often all so tokenistic and as a drinker I just ask that if provenance is a selling point, make a big one that permeates through everything so that it’s obvious for all to experience. What’s your favourite cocktail and why? I don’t really feel it’s fair to say a G&T is a cocktail and I almost always order a Negroni in a bar, but my holy grail is a French 75. There’s such a sense of occasion about it and I love the permutations that are possible between changing the bubbles, flavouring the syrup or swapping the type of gin. What makes Scottish Gin “Scottish”? From what’s being produced, I don’t think there is a definitive hallmark. For example, there isn’t a clear defining regional style or distinct commonality to the flavours being made by a majority of distillers there. Compare that to South African or Australian gins, where in their case native botanicals tend to come up over and again (fynbos for the former, lemon myrtle the latter), and which may in the long term emerge as a defining national interpretation on what people expect from the region’s gin flavours. Scots have no clear national flavour preferences that are any different to the rest of the UK – or distinct grouping around an ABV (contrast that with American Gins that are on the whole, likely to be juniper light and at 47% ABV). Production wise, there is clearly no singular practice in the way it’s made that’s unique to the region either, nor is there a predominant use of an unusual or distinct base spirit. Scottish Gin, it seems, is only currently bound by one fact; that it’s made in the country. Which Scottish Gins are on your wishlist? It’s hard not to lust for Isle of Harris. They present such a formidable package in that there’s so much to engage with, from the distillery ethos, the provenance, to the liquid itself and of course, to the way it looks. Would you like to see clearly defined geographical categories in gin? I don’t think a category based around geography is suitable based on the lack of commonality in production or flavour. That said, I really feel that there should be a law that says that all producers must state where it’s made, somewhere on the bottle, down to the nearest county / region. Globally speaking (not just UK here) an entire country is too big an area, a town too small. It really wouldn’t be that hard for all to add the distillery’s location somewhere and this would avoid a lot of frustration for drinkers. Do you feel more regulation and protection of gin as a spirit category would stifle innovation? I can see why it would be controversial of course, that over-regulation would stifle. I wonder if new regulations are actually needed (to reflect the category today) or if it is more important to actually enforce what’s currently there (as even where valid they are abused at every turn). There’s a strong case for both arguments. Either way, there is a long way to go between what there is now (or how it’s being enforced) and having a set of rules that shackles those prepared to apply some due diligence and consideration to their R&D. Innovation doesn’t have to come at the expense of authenticity. Furthermore, progressing the category to remain relevant does not have to betray years of heritage. Most of the things we’ve come across in the past two years that are really innovative are done completely in the rules and are actually quite respectful of what Gin is about. All the “innovation” that people tend to talk about, like Pink, like liqueurs, aren’t innovative at all and the tag is being misused. They are just novel and unfortunately novelty’s only benefit is its newness. The question I would therefore ask is would it stifle innovation, or simply dissuade novelty. What are your thoughts on contract distilled gins? I have a very mixed relationship with them. I love the fact that it allows so many to enter the market at a reasonable price and timeline. Many of the contract houses have far more talented distillers than elsewhere too, as they have had a much broader distilling experience than making one or two products. It’s also undeniable that there are some truly world class gins being made by contract makers. The issue for me comes in the way that some of those contracting absolve themselves from anything to do with the product they make for a client and the ethics that surround how that business operates. There are many instances of this but perhaps most pertinent to the scene in Scotland is around geography. They may not be the ones lying about where it’s made, but they’ll happily take the money to make it and be quiet, rather than insist that the brand declare it as part of their terms of service. At some point you have to say they are complicit in the issue. What’s the best piece of advice you could give to someone who wants to make gin? Understand that what you are actually selling is so much more than the booze in your bottle and that if you can’t articulate that, present it and imbue it into everything you do and everything you have made, you’re not going to make it unless you have very deep pockets. Which bloggers or other gin related websites do you think people should be following? My biggest fear is that the commentary around Gin becomes more akin to navel gazing by an insular tribe as opposed to bridging the gap between it and the mainstream. Whisky did that for a while and it’s been a long journey for them to reconnect with a broader audience. Outside of this, I’d recommend that outwards looking inclusivism and encourage all to make it part and parcel of what everyone follows. Have a look at PunchDrink.com, Australian Bartender, Cocktail Lovers Magazine and Hot Rum Cow for a weekly dose of escapism and alternative perspectives. How do you think bloggers and other gin communicators can add value to the story of gin? For blogs; Identify who the intended reader is and take their understanding one step on from where they are currently. That provides the most value to the category as each site caters to a slightly different audience and hopefully, means that all types of drinker are being enchanted, educated and valued. As communicators, understand the difference between celebrating and critiquing, and the need to do both. Where would you like to see the gin category in 10 years? For Gin to avoid being where Vodka is today. Rather, a better aspiration would be for it to be where Whisky is at currently. If that’s the case, even if the cool factor has long gone, the sales volumes would remain healthy and steady, while the consumer interest lives on and really exciting brands thrive. What’s next for the Gin Foundry? You can learn more about Gin Foundry by visiting the links below.